Love this cool mint flavour gives you such a fresh breathe that lasts for ages! I like that this product also comes in the large bottle, medium & travel size. Very handy! Listerine coolmint mouthwash tastes good and leaves my mouth fresh and clean after brushing,l use it twice daily and love it! A must have in the bathroom! I like it… i does the job it Comes with a clean feeling.but most of the time i just dont use it. Dont know why. This drys my mouth out and if I didn’t think it necessary to use it, I wouldn’t. On the other hand, it packs a real punch, I can just imagine all the bacteria it kills! I swish it around my teeth and gums and gargle it in my throat! 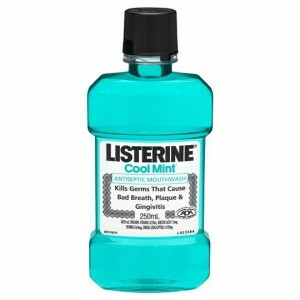 How would you rate Listerine Coolmint Mouthwash?